There are 9 reviews of Anna Sui. i'm not adding anything earth shatteringly different than anyone else here that gave this a positive: a pretty whisper of a perfume of violets, rose and powder. very similar to agent provacteur eau emotionelle. the bottle is more beautiful than any thing else about this perfume. It has a nice soft scent that is not overly flowery or powdery. But once I put it on, I can barely smell it. It disappears too quickly on my skin. :( Sounds like it works better for others. I really wanted to like this one, too. Very powdery rose/violet scent. I don't get any fruity notes. Reminds me very much of Lutece by Dana without the Lily of the Valley. My first perfume love and all time go to perfume. I can never be without this! I always sort of felt it was the perfume companion to my favourite tea (Twinings Blackcurrant) It really does go with its image of an old fashioned luxe hippie bohemian goth and it also has a "fancy" vibe, sort of victorian maybe? Powdery roses and gothicly wallpapered boudoirs! Anyway! On me it has the most divine drydown of all time, woodsy, smoky and waterlily! Also on me its not very perfumey, just a beautiful smell that becomes part of me and quietly wafts. And the roses are so unusually dark and never womanly or old ladyish (not that thats a bad thing) you really believe the roses are purple. Excellent lasting power. this fragrance is so whisper soft smelling...i wish it had more staying power, but it smells so delicate and pretty i can't help but wear it. NEW: Anna Sui - Fairy Dance Sun For Women! 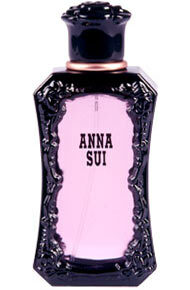 NEW: Anna Sui - Fantasia For Women!